Rejoice with me! Remember how I joined Facebook last week? Lastnight, while most of the town slept, the Leonard Pennario blog made it to Facebook's list of 10 Most Popular Buffalo Blogs. It displaced a blog devoted to the Buffalo Bills and the Buffalo Sabres! So much for people who tell us: "Buffalo is a blue-collar town." Sorry. The numbers are in. I challenge you to find any other city where one of their Top 10 blogs is devoted to a dead concert pianist. Well, OK, every once in a while to spice things up I do throw in stuff about Mass at my church. Some might consider that dirty pool. Also Leonard Pennario is a special case in that No. 1, he happens to have been the greatest American pianist, and No. 2, he was so good-looking that even when I am in a hurry, like today, I can just show a picture of him and everyone will be happy. You cannot say the same about other pianists! 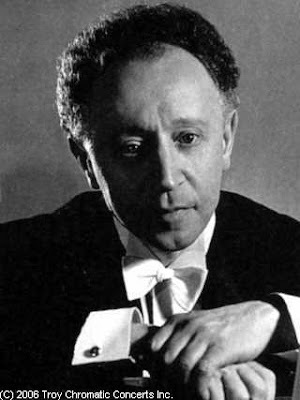 I mean, here is Arthur Rubinstein. Rubinstein was this great Lothario. He wrote two books about all the women he maneuvered into the sack. Pennario and I both read those books and we used to talk about them. He was friends with Rubinstein and adored him although we used to giggle about some of Rubinstein's exploits. But in the looks department, no comparison. 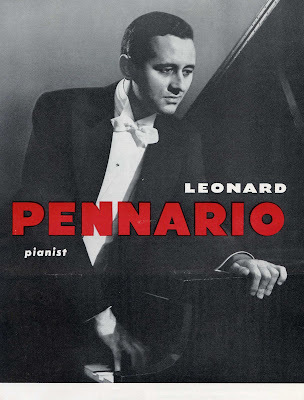 If Rubinstein had looked like Pennario imagine what he would have accomplished. Anyway, my blog victory is a great achievement for me and for the wonderful and cultured city of Buffalo, N.Y. Thank you, everyone, who joined my nascent blog network and made this possible! We gave 100 percent as they like to say in the Bills locker room. That is the good news in my life today. The bad news is that with my priorities being what they are, Christmas '08 is pretty much a wash. Imagine when you drop a glass ornament and then someone steps on it. That is like what my Christmas is like. Did I put up a tree? No. Is my mantle lined tastefully with candles and pine boughs? No. Did I recklessly make plans to go to midnight Mass with my friend Jane, thus throwing off my sleep schedule for at least a week and costing me hours and hours of work on my book? Yes!! Tonight my little nieces are coming over to bake cookies. So late lastnight there I was, mixing up gingerbread dough and then a pile of dough for cutout sugar cookies. I was listening to WNED-FM and it was wild! They were playing World War II-era radio broadcasts of big sopranos singing Christmas carols. You got to hear Ernestine Schumann-Heink singing "Silent Night." And a few German Christmas songs I have never heard, beamed from Berlin in 1944. Unbelievable. As I said this is a great town. I am pretty sure this is the performance they played. Ahahahahah... look at what it says in the little intro to this video. "An old German Christmas song, which is one of the most beautiful specimens of its kind in existence." It would take another cup of coffee for me to figure out exactly what is funny about that wording, but something is. Today I have to detour somewhere to buy nuts and sprinkles and stuff. Lastnight on the way home from work I was going to go to the Hertel Market, where they have all of that. But the roads were so awful! On Delaware on the way to Hertel the car in front of me stopped suddenly and I almost slid into him! That was when I turned into Scarlett O'Hara in that scene where Scarlett decides she has had enough with the siege of Atlanta. "I want to go home!" I started crying. "I want my mother! My mother needs me!" So here I am with no nuts and no sprinkles, in addition to no tree and no pine boughs. Well, there is the wreath on my door so all is not lost. And the gingerbread dough in the fridge. And a blog about Leonard Pennario is now among Buffalo's Top 10 blogs. How is that for an early Christmas present? Christmas tree still in the tree lot (somewhere)? House pretty much decorated for Labor Day? Looking forward to four hours of sleep after Midnight Mass, followed by another morning service and then a mouth-drooling, fitful upright snooze on the in-laws' couch while all about you celebrate the Miraculous Birth? Welcome to the life of a church musician. Ho-ho-freakin'-ho. Thanks for the Schumann-Heink. Her use of the easily abused portamento is masterly. I think I read somewhere that she used to sing Stille Nacht on the radio for quite a number of years. She also was a regular at Bayreuth for a long time and Cosima Wagner used to address her as "my Erda." I also have a personal memory of this carol, but I don't know if I should share it, so I'll stop here. AND BLESS YOU, BLESS YOU, BLESS YOU for leaving the "H" in Arthur Rubinstein. It kills me when these phonies who never check anything out spell it as Artur.